All about Chicago's 2018 gay, LGBT, GLBT pride parade and festival weekend - what you need to know, tips to survive, who you'll see: performing acts and more. Chicago Pride Weekend consists of a two-day festival and our world-famous parade. 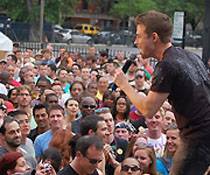 The two-day festival takes place along Chicago's famed Halsted strip on Saturday, June 16, 2018 and Sunday, June 17, 2018. The parade takes place over a four-mile route on Sunday, June 24, 2018. The parade kicks off at noon on Sunday, June 24, 2018, at Montrose Avenue and Broadway in Uptown and ends near the intersection of Diversey Parkway and Sheridan Road in Lincoln Park. Pride Month in June is the culmination of Chicago's vibrant LGBT community. The energy in the city peaks on Pride Weekend, which falls on the last weekend of June each year in commemoration of the anniversary of the Stonewall Riots. On Pride Frida and Saturday thousands will gather along Halsted for the two day festival. Stages of music, exhibitors, great food and drinks are available to enjoy. In the evening the revelers will pour into Boystown clubs and party into the wee hours of the night. On Sunday the roar of the crowd heralds the start of the Pride Parade, a dazzling cavalcade of diversity. The streets are lined 12 people deep as 750,000 people cheer the contingents on and enjoy the show, culture and experience! For the liveliest viewing spots head to the Boystown section of North Halsted Street, between Belmont Avenue and Grace Street. If you are seeking a less crowded area to view the parade, look for your viewing spots near the beginning of the route along Broadway between Montrose Avenue and Sheridan Road or further along Broadway between Belmont Avenue and Diversey Parkway. It helps to know some tips, tricks and pearls of wisdom for surviving the weekend and ensuring a fun, happy and safe stay in Chicago. And if you're visiting just for the weekend, you might find some special offers on hotel rooms on ChicagoPride.com. The Chicago Pride two-day Celebration takes place the weekend before the parade. And the Parade historically takes place during the final weekend in June of each year. The annual Pride Celebration commemorates the rebellion of LGBT patrons of the Stonewall Inn in New York City's Greenwich Village in response to a routine police raid on June 27, 1969. The following year, a "Gay-In" that took place on June 27, 1970 that was the early progenitor of the current Pride Celebration. Since 1972, the event has been held every year, Since its modest beginnings, Chicago Pride has grown to be one the largest and most well-known Pride events in the world. Pride has come to symbolize several things: the long history of lesbian, gay, bisexual, transgender, and queer dignity, the freedom of all people to meaningfully and proudly express their sexual and gender identities, and the commitment of LGBT people to combating oppression. Do I need a ticket to get into Pride? There is no fee to attend the Pride Fest or watch the Parade. A voluntary donation is requested at the entry gates to Pride Fest. This donation goes back to community support programs. Is there an age limit for entry into Chicago Pride? The Pride Fest and Parade are open to people of all ages. Where can I stay near Pride events? Hundreds of thousands of people from outside Chicago come to the city for Pride each year. Find information on local lodging. Apart from Pride, Chicago is also known for its world-class public transportation system, so please consider familiarizing yourself with the CTA (for transportation within the city) and with METRA and Pace (for transportation from the suburbs into the city). To find routes from anywhere in the Chicagoland area to Pride Fest and the Parade visit transitchicago.com. Yes, pets are allowed, including, of course, service animals assisting people with accessibility needs. We do, however, strongly recommend leaving pets at home since both the Parade and Festival are noisy, crowded, and hot. Pets can sometimes be very startled by the crowds and sounds of Pride. In busy areas, it may be difficult to navigate with pets who will be walking on the ground given the high number of stomping feet moving through the crowd. Visit ChicagoPride.com for the ultimate 24/7/365 online guide to Chicago's vibrant LGBT community.